Build the perfect kennel for your pet. When working out how to build a dog house, the first thing you will need are some plans. Designs vary, and you can find some very cool plans for dog houses on the web. You can buy a DIY dog house kit that you assemble yourself or simply construct a box with a sloping roof and a hole in the side (no dog kennel plans needed!). As you are reading this article we assume you would like some guidance on how to build a dog house and dog house plans. Build the house to the size and quality that will make your dog feel safe and comfortable. Not too big or small. No drafts! 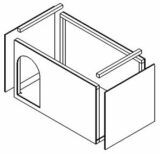 There is a detailed description of the ideal dog house on our dog houses page. The real beauty of learning how to build a dog house is that you can make your dog house a place your dog will be proud to live in. So, don't be afraid to embellish and improve on the plans you buy. You also save money, how fantastic! The best material to use is of course timber. Not only is wood easy to use, it provides a warm comfortable environment for your faithful friend. Allow half a day for preparing the timber or get your local lumber merchant to cut it to size for you. Most basic designs then should only take a further 1/2 day to build (less if you are skilled). Your completed dog house can then be stained or painted. We recommend just sealing the inside to ensure a clean and safe environment for your dog. When finishing the outside, anything goes to suit your taste. However, make sure that your choice is not poisonous to animals! Using dog house plans to build your pet's home ensures that you get something that will not only suit your dog, is the right size and is of good quality but, that will give you a great feeling of satisfaction and save a bit of cash too! 3 easy to choose from designs which shoe you hot to build a dog house. They are easy to build yet look really good and fulfil the requirements needed by your dog!